thanks, some very interesting reading. I wonder how this would work for speed readings, as the underlying technique on GPS tends to be a doppler measurement on some of the signals. Not sure how GLONASS or the others measures/calculates speed. With different orbits, different reference clocks etc, it will need quite some corrections to get a speed using satellites from different constellations. Last edited by tsk1979 : 12th April 2019 at 12:51. This paper shows that it can be done, not that it is being done. I am interested so I have searched around a bit. I have found quite a bit, but I haven't seen anything yet that suggest that there are chipsets available and being used to provide proper integrated positioning. Rather than switching between two different constellations. Not a technical paper, but a somewhat direct proof that this is already being done is the screenshot below. This is a screenshot from "GPS Status" app, which shows the satellites used in the current fix. The satellites shown by green circles are GPS satellites, whereas those those shown by green rectangles are GLONASS satellites. The app shows that it has used 14 satellites (out of 23 visible satellites) for obtaining the current fix, and as you can see, those 14 are a mix of GPS and GLONASS satellites. At many times, in areas of poor visibility to sky (such as inside my office), I have seen fix obtained with only 4 satellites, and even there it can do it with a mix of GPS and GLONASS satellites. The app shows that it has used 14 satellites (out of 23 visible satellites) for obtaining the current fix, and as you can see, those 14 are a mix of GPS and GLONASS satellites. Thanks, that is an interesting app too. I need to find something like that for my iPhone. with so many satellites from both systems available it does beg the question how it would calculate a position. It has sufficient satellites to calculate a 100% GPS and a 100% GLONASS position. So if you have sufficient GPS satellites in view, why would you use GLONASS satellites as well. Would that not decrease the accuracy? I think it might be to do with the dilution of precision (DOP) as well, or rather that is where using different constellations might have a considerable effect. For tracking purposes, the more satellites you can track from more system the better it is obviously, but not necessarily for precision. 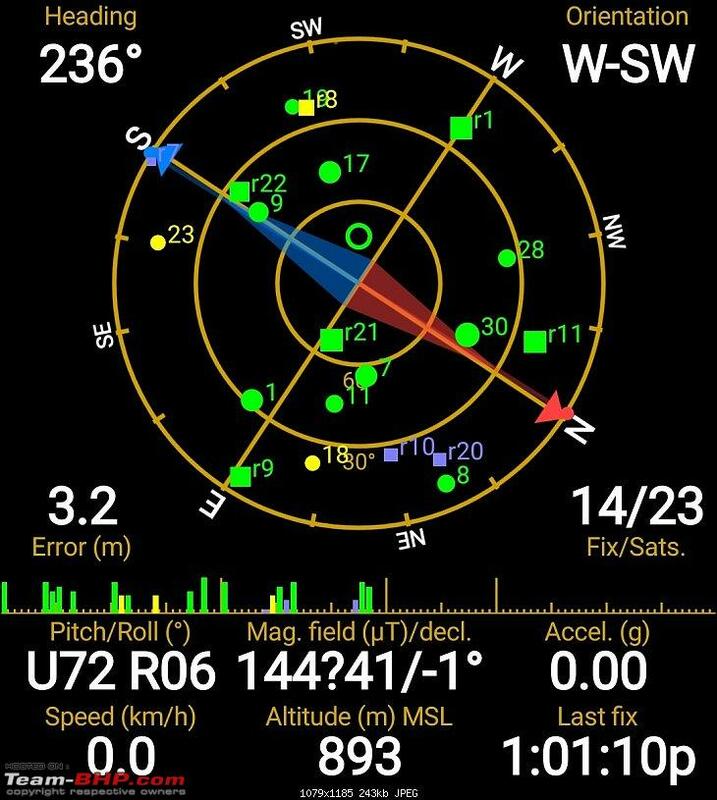 I am not an expert in GPS technology, but from what I have read and from what I have observed, more number of satellites used in the fix generally (not always) gives more accurate position. The Dilution of Precision (DOP) that you mentioned is one factor. However, in general, with uncertainties in calculations from individual satellites, there is always some overall uncertainty in calculation of the net position. With 4 satellites, theoretically it is enough to calculate the position (i.e. to get the fix), but the uncertainty will be high. From my observations, whenever I get fix with only 4 or 5 satellites, the errors are about 50m. As you get data from more and more satellites, it looks like (from what I read) the positioning algorithm uses a least square based averaging, which can reduce errors by using all the data, and the accuracy of net position increases. Mathematically speaking, with 4 unknowns, and 4 equations (i.e. fix from 4 satellites), you can solve this system of equation and get a solution. However, given that there are uncertainties in the 4 equations, your answer will have uncertainties. Further, if these 4 equations are not independent (i.e. the 4 satellites are not sufficiently away from each other), then you will have an "ill conditioned" system of equations. In such cases, it will help to use more number of equations. However, now you have more number of equations than unknowns. Therefore, instead of a "direct solver" (which would solve this as system of equations using only four equations, and will not be able to make use of extra equations), one could use a "least squares solver" which would try to minimize the errors averaged over all the equations. In simpler words, one would use an averaging method that would find a position using many satellites such that average error is very low. As you can see, the error decreases (i.e. the accuracy increases) with more number of satellites used in the fix. However, please note that the above is a general case I chose for illustration. It is usually this way, but not necessarily always true. In some cases, depending on which particular satellites are used, sometimes you may get higher errors even with more number of satellites (and this is because of the degenerate system of equations - some of the equations will not be linearly independent). Last edited by Dr.AD : 14th April 2019 at 19:57. 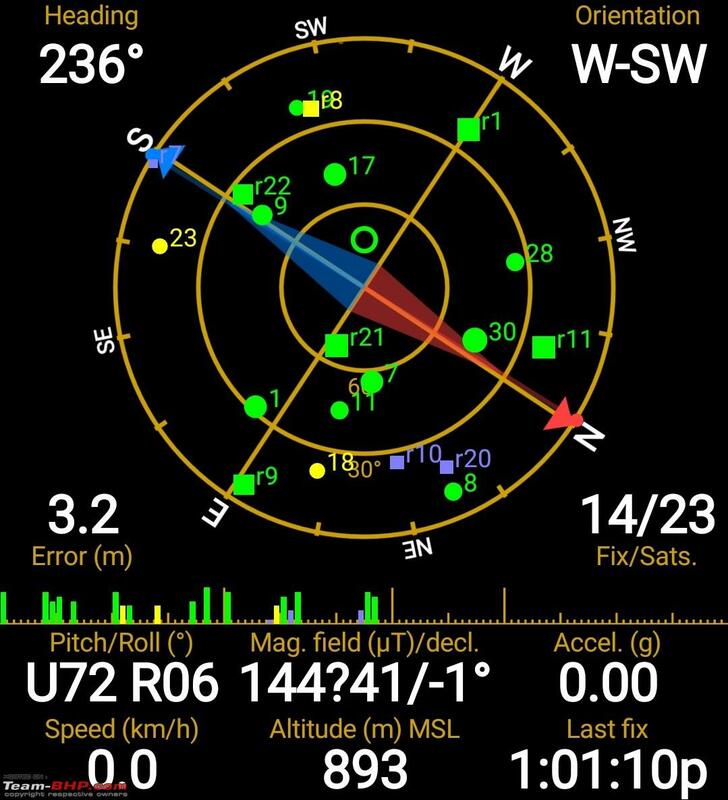 Being a Merchant navy captain, the Navstar GPS is a very important piece of equipment onboard which is connected to many navigational equipment on the bridge / wheelhouse of the vessel. The discussion here has covered all major aspects, so there is nothing much for me to write about. Thanks to all on this thread to share such valuable info. This is a very useful Android app called "GPS Status & Toolbox". Just a note - 'GPS Status' tracks you whenever you turn on location (irrespective of whether you are using it). And sells data collected. (I even paid for the pro version! Uninstalled now). Last edited by Sutripta : 14th April 2019 at 22:11. Thanks for all the extraordinary posts here. I learnt a lot over the past few days. Added to the epoch rollover, I read about the following hacking of GNSS as below. This is all becoming downright scary about our dependence on things that are vulnerable to manipulation by state powers. It is beyond me why anybody would rely on Russian technology for anything as critical as this. It’s ok in an iPhone or a car navigation. But on a plane or a ship? I don’t know why you would want to have GPS and GLONASS out at sea. No problems with getting satellites I would think? By the way, also GPS gets regularly jammed due to military exercises. Contrary to the Russians the Americans will publish exactly where and when you can expect problems with GPS. Note jamming is something very different from the hacking/interfering as suggested in the previous post. GPS needs 3 satellites to calculate a position, fourth satellite will make it more accurate. Mathematically speaking, with 4 unknowns, and 4 equations (i.e. fix from 4 satellites), you can solve this system of equation and get a solution. Backup/ fallback/ reliance on a foreign government/ reliance on technology not in your control. The owner/ controller of the system does not have to jam the system. eg the US can just switch off the civilian part, or switch SA back on. Jamming/ spoofing/ hacking all are possible. And are different from each other. @DrAD what's your ELO rating? Why don't you start a thread on say your favourite games, with comments. Thanks for pointing this out. I did not know this. I will be careful. However, when I checked the permissions for this app, it only has permission for location. I have disabled every other permission (including storage) to this app, and it still works well. So it can get only anonymous location data. Sadly, there are so many other apps that have access to location data (food delivery apps, shopping apps for example), and from what I have heard, they also use/sell/share anonymous (or rather specifically anonymized in their case, since they actually have the identifiable data) location data. So looks like there is not much we can do about anonymous location data. Yes, 4 satellites are minimum required for a 3-D fix (including altitude), and 3 satellites are required for a 2-D fix (longitude and latitude only), based on the assumption that you are at mean sea level. Interesting. With modern chips, I don't think solving a least squares is much of a problem. Anyways, I am not sure exactly which algorithms are used today. However, as I mentioned earlier, one can clearly observe that the position accuracy increases with more number of satellites. So I assume some form of overdetermined solution is used in reality. Else we would have seen more or less constant error with more than 4 satellites. In reality, what I have observed is that the error becomes constant only when more than 12 satellites are used in the fix. Upto 12 satellites, the error decreases monotonically with number of satellites. And there is definitely additional benefits is using more satellites upto 12, and after that there is no additional benefit. I had a decent ELO rating about a decade ago when I was an active player. Now I am not, and only play some casual games on the internet. I did not realize there is no thread about chess games. Surely we should start one. Are you a chess player too? Thanks for pointing this out. I did not know this. I will be careful. So looks like there is not much we can do about anonymous location data. People knowing where your home is is different from knowing your travel patterns. Both are bad, in different ways. Data is anonymized, but does not take much to fit back the pieces. based on the assumption that you are at mean sea level. That is an added operation - 'clamp to ground'. (Google Earth/ KML calls it tesselate, though that is not the dictionary meaning of the term). The Sirf Star3 was the first of the commercial consumer GPS chip with acceptable performance. In that DOP values were calculated on the chip, and read in by external circuit. Along with other values like lat/ long. Not calculated externally. Don't know, but I think the philosophy would be the same on other modern implementations, including Qualcomms. The VLSI experts here will be better able to explain (or contradict) it, but digital circuits (gates) on a silicon wafer essentially fabricated to handle analog signals is costly, and so kept to a bare minimum. If one is seeing only a limited number of satellites, in all probability one is seeing only a small quadrant of the sky. Tunnel vision. One is unlikely to get good accuracy in that case. I think something a bit more sophisticated than least sum of squares is used. Kalman filters! Are you a chess player too?